Pond Winterizing Tips All tips on this page should be scrutinized for their application to your individual needs. Everything you need to know for winterizing your pond. All tips on this page should be scrutinized for their application to your individual needs. Keep leaves, twigs and other debris out of your pond. Use a mesh pond netting to cover you pond. If a net is not used it is important to remove leaves as some leaves can turn the water brown and can be toxic to fish. Add Microbe-Lift Autumn/Winter Prep, this helps accelerate the decomposition of leaves, scum, sediment and other organic matter during the fall and winter months. Microbe-Lift Autumn/Winter Prep will also jump start your pond to a healthier environment in the spring. As the water temperature drops your fish will become less active. At water temperatures below 50° fish become almost motionless, hibernating in the deepest and warmest part of the pond. Fish are the most attractive at this time of the year because the decrease in the water temperature intensifies their coloration. Koi need an open area in the ice, which provides them with an oxygen / gas exchange. Do not place a pump or air bubbler on the bottom of the pond as this will result in warmer water at the bottom being pumped to the surface resulting in cold or freezing water. Raise the pump or bubbler well off the bottom of the pond, or better yet, use the Thermo-Pond 100 watt energy efficient floating pond de-icer or one of the many other de-icers that we offer. The Thermo-Pond de-icer is the world's most successful and efficient low wattage pond de-icer, it can save you 30.00 to 50.00 a month in electricity compared to 'stock tank' de-icers. 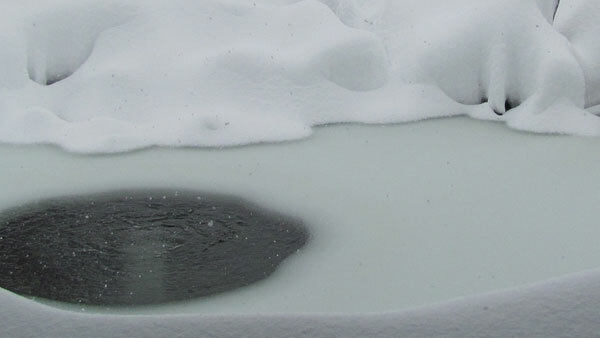 Never break a hole in the ice as the shock could be harmful to the fish. Unless the pump and filter are to remain in operation (some of our pond friends in protected areas operate their pump and filter throughout the winter) clean both the filter and the pump before storing for the winter. Do not store in the house as the odor could become quite strong. Once winter approaches and the water temperature of the pond drops, the hardy lilies automatically go dormant. If any new leaves appear, they will be very small and will remain under the water, close to the soil. As the foliage browns, simply prune and lower the lily to the deepest part of the pond.If a sufficient depth of water can be maintained so that freezing does not occur at the root level, the hardy lily does not need to be removed from the pond. If there is a possibility of the pond freezing solid, there are several methods of protecting the lilies. If you prefer to leave the lilies in the pond, place boards, side by side across the top of the pond. Cover the boards with mats or layers of straw or leaves, weighted down with stones. In the spring, as the ice thaws, all coverings must be removed to prevent premature growth. You can also bury the water lily tuber in the ground. The hole should be eighteen to twenty-four inches deep and covered with leaves or straw. Simply replant in the pond in the spring. For indoor storage until spring, a cool basement or heated garage are possible choices. The lily tuber should be covered with moist burlap, peat moss or leaves. You could also cover the soil with newspaper and place the entire container in a sealed plastic bag. Check occasionally that the soil is moist. Tropical lilies are most often treated as an annual. They continue to grow and bloom until several freezes drive them into dormancy. If you choose to store lilies through the winter, a greenhouse is the most successful way. Provide only 10-20% of the space of your pond. A wash tub or tank is suggested. The lily should be kept small, therefore, do not fertilize. Another method is to use an aquarium. Pot the lily in a 4-6" pot, plug holes, and place in at least a 20 gallon tank. Heat the water to 70-75 degrees F and place a florescent grow light close to the top of the tank. Do not encourage growth. Simply keep the lily alive. Some specialists consider starving plants in late summer, causing the formation of tubers. Once all leaves are dead, feel under the crown for a hard tuber. Remove the tuber and wash it thoroughly. The smaller tubers generally make the nicest plants next spring. If there's any root or stem tissue still attached to the tuber, air-dry a few days and snap it off cleanly. Again, wash the tuber well and place it in a plastic bag or mason jar. Fill the container with distilled water or slightly moist sand store it in a cool dark place, at approximately 50-65 degrees F. Be sure to check the container regularly. If the water is foul or discolored, replace it with fresh distilled water. Remember when spring returns a tropical lily should only be placed in water at least 70o. Do not rush the plant outside. It could return to dormancy or it may die. Cut plants to 6" from the top of the pot and place in bottom of pond after the first heavy frost. However, hollow stemmed plants should be trimmed above the water line. Trimming these below the water line could cause rotting. Should be moved indoors before the first frost. Plants must be kept in water. All floating tropical plants including water hyacinth and water lettuce should be discarded unless you bring them indoors and keep the water temperature at least 70 degrees F. and use a good grow light. A rather expensive endeavor. Cut back to 2 to 3" above pot and place in the bottom of the pond. Decaying plants will foul water quality and should be removed from the pond.